A graffiti vandal responsible for hundreds of thousands of pounds worth of damage across London stands to make a four figure sum by selling his work. Daniel Halpin was given an ASBO and jailed for spraying his TOX tag on trains and walls for nine years. Now he is selling 100 canvases, bearing his notorious mark, at £75 each. Although the law prohibits people from profiting by criminal acts, the BBC has learned he will be able to keep the cash because of a "glaring loophole". 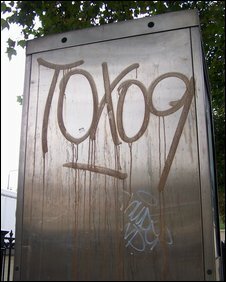 Mr Halpin's spree began in 2001 when the tag TOX01 started to appear. It can be seen as far afield as Paris and one London Underground manager said: "I don't know anywhere you can't see a TOX tag - they are in places even I don't know how to access." At the height of his spree Mr Halpin, from Stockwell, south London, spent four-and-a-half months in Feltham Young Offenders Institution for breaching an ASBO. In what some graffiti artists call "cashing in" on his notoriety, Mr Halpin has now begun selling prints of his tag through street art company Souled Out. Souled Out owner Chris Bowden said of Mr Halpin's behaviour: "It's an addiction to bombing [painting] trains - he lives for it, and treats it almost like a job with research, passion and commitment. "He just wants to 'get up' more than anyone else - that's all taggers want, to get their tag on as many walls more than anyone else in the hardest to reach spots." The Proceeds of Crime Act prevents convicted criminals from benefiting from their crime. Two anonymous graffiti artists give conflicting opinions on Halpin's work. TOX's stuff is an eye sore that gives graff a bad name. There's no skill or flow involved, its just down and out vandalism - just like kids with markers writing 'I was 'ere'. It's pointless and no-one wants to look at it. Master the art, then hit the streets. TOX is one of the greatest graffiti artists I have ever seen. With the ratio of criminal damage against arrests he should be displayed in the Tate Modern. He has embarrassed the police, outwitting all their CCTV and security schemes. He is a genius and an inspiration to all artists. TOX is a urban icon. But Christopher Coltart, a barrister and financial crime specialist at 2 Hare Court chambers, told the BBC the legislation would not apply to Mr Halpin. Mr Coltart said: "The difficulty is there is nothing in itself unlawful about him spraying his tag onto the canvas. "The issue is whether he is looking to exploit previous criminal activity which has given rise to his notoriety. "I doubt whether that is covered - you may have identified what is a glaring loophole." The Coroners and Justice Bill - currently going through parliament - is intended to strengthen the law on profiting from crime. But Mr Coltart said the act would still not be enough to retrieve money from the "bulletproof" graffiti artist. He added: "It is morally wrong that he could make money from his vandalism - everyone would agree with that. "That's why it could be viewed as a loophole that needs to be cut off." A Ministry of Justice spokeswoman said: "There is no loophole in the Coroners and Justice Bill - the provisions will target offenders who exploit their offences." Cashing in on crime memoirs?